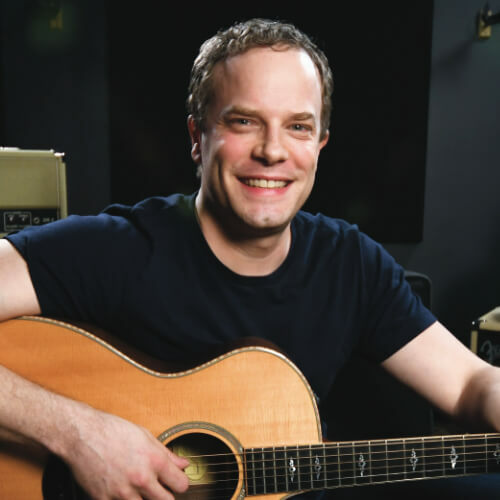 In this holiday guitar lesson, we'll be learning the iconic Christmas song Winter Wonderland. We'll go through a simplified version of the song that focuses on the basics of rhythm guitar. It's a great tune for working on your open chords, bar chords, and strumming. 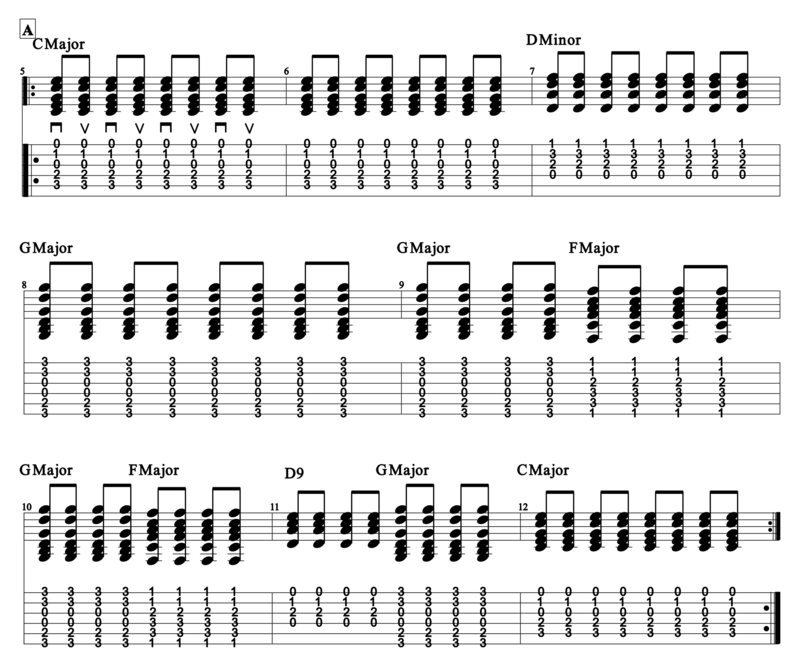 To jump into this lesson you'll need most of the basic fundamentals of the guitar down. You should know the basic open chords, a bar chord shape, and how to strum the guitar. This song uses something called a "swung" sixteenth note strumming pattern. A swung sixteenth note strumming pattern is very similar to a regular sixteenth note strumming pattern. To get an idea of how it should sound be sure to watch the video above. The first section of Winter Wonderland only uses one chord. This chord is an open G major chord. You'll be holding this G major chord for four measures and speeding up your strumming each measure. These measures will lead you into the A section of this song. The A section of this song is where you'll begin using the swung sixteenth note strumming pattern. There are some pretty quick chord changes here so you may need to practice this section one measure at a time. You'll be using a C major chord, D minor chord, G major chord, F major bar chord, and D9 chord to play this section. Once you've got the hang of the A section of Winter Wonderland you can add the B section. 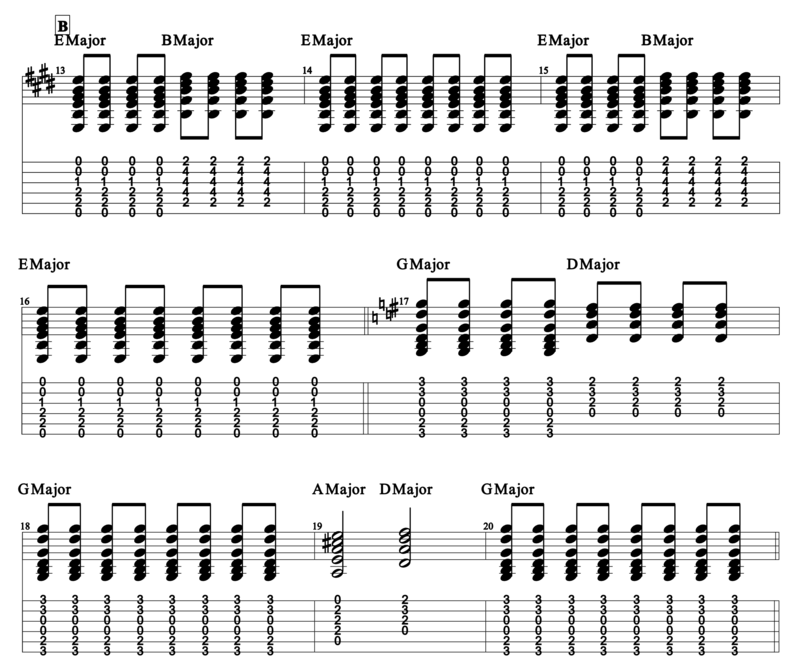 This section also has some pretty fast chord changes, so be on the lookout for that. Here we'll be modulating into the key of E major and G major. So we'll be using some chords that don't occur in the original key of the song. We'll use E major, B major, G major, D major, and A major. Once you've got all three sections down you'll be ready to try playing along to the jam track. It moves pretty quickly, so if you need to attempt it slowly at first that's okay. Try playing along to a metronome and getting all the changes and strumming pattern down first if you need to.